When you&apos;re planning a trip, you can use travel guides, lots of online research or just hope for the best. Or...you can use Utrip -- a new, free travel planning tool that&apos;s as fun to use as it is amazing. "Utrip is for anyone who&apos;s ever gone on a trip with high expectations for an unforgettable experience, only to end up at a chain restaurant or hotel because it&apos;s safe ," said Spokane native Gilad Berenstein, founder and CEO of Utrip. "As a native, I know Spokane has so much to offer visitors. With Utrip, travelers are now able to easily create personalized itineraries based on their interests and budget, and experience the sites of Spokane that most appeal to them." Travelers can access the Spokane Utrip travel planning technology from the visitspokane.com homepage. 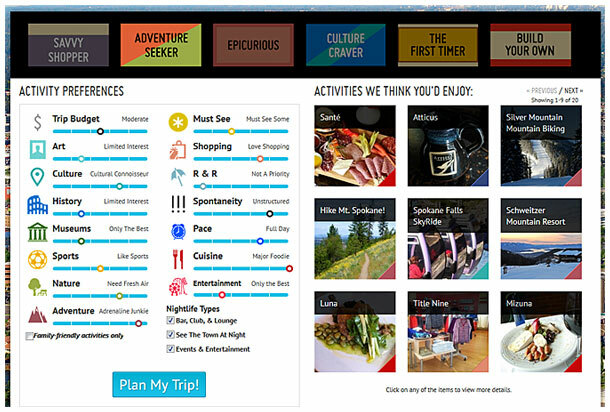 Users can also use the hashtag #PlanSpokane on social media to share their own trip planning experience and to explore other users&apos; trips. "Utrip will give visitors the keys to living like a local," said Jeanna Hofmeister, Chief Marketing Officer, Visit Spokane. "We&apos;ve got a great lineup of local experts who are sharing their insider knowledge so visitors will be able to experience everything locals love about the Spokane region." Utrip is a free travel planning platform that brings together the best in artificial intelligence and human experience, making it easy for travelers to create their perfect trip. Founded in Seattle, WA in 2012, Utrip&apos;s predictive technology works on a vast travel database that has been curated by local experts. Once a traveler indicates their interests and budget, Utrip&apos;s algorithm sorts through millions of combinations of must-see sites, activities and restaurant recommendations to deliver personalized itineraries - in minutes. Travelers may then book lodging and share their itineraries with friends. Utrip&apos;s companion mobile app provides access to itineraries, directions and personalized recommendations on the go. Utrip PRO, the white-labeled version, allows businesses to offer personalized travel planning on their sites. To learn more about Utrip or to plan your next adventure, visit utrip.com.